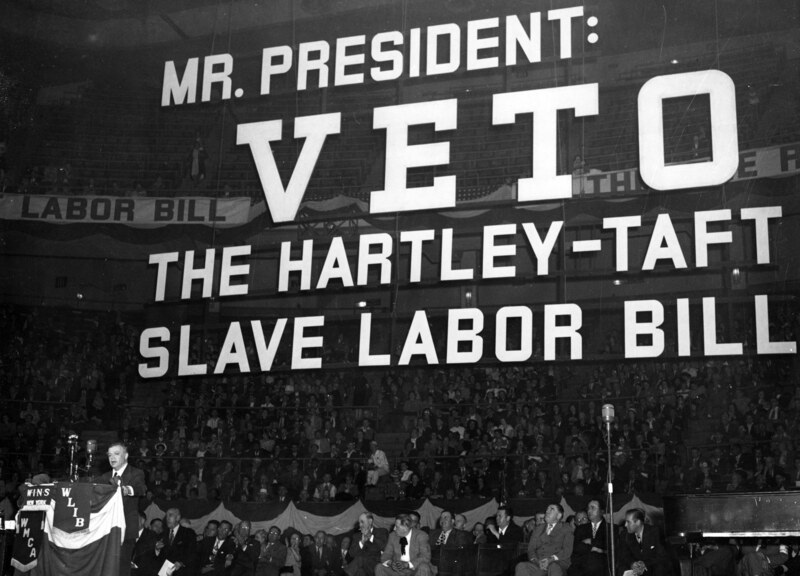 Seventy years ago, the Taft-Hartley Act ushered in “right-to-work” laws and imposed draconian restrictions on workers' rights. The labor movement still hasn’t recovered. The current assault on workers’ rights and labor standards is unrelenting. Federal labor policy has been undermined by the Trump administration’s deregulatory fever and deference to low-road employer interests. In the states, the corporate-inspired attack on public sector unionism has spread from Wisconsin to Iowa and beyond. In January, the Supreme Court will hear arguments in Janus vs AFSCME, whose decision will almost certainly allow anti-union public employees to opt out of paying dues and, therefore, evade the costs of negotiating and administering collective bargaining contracts. But while the ferocity and pace of this legislative and administrative assault is new, its motives and logic are not. Recent efforts to undermine the democratic and associational rights of public sector workers echo and mimic attacks on private sector workers that began seventy years ago, with the passage of the Taft-Hartley Act in June 1947. Taft-Hartley capped a tumultuous decade and a half in US labor relations and labor law. In 1933, three years into the Great Depression and a hundred days into his New Deal, Franklin Roosevelt signed the National Recovery Act, which sought to at once tightly regulate competition and protect workers’ rights. When the Supreme Court ruled the Recovery Act unconstitutional two years later, workers — encouraged by the law’s nod to collective bargaining — pressed for both union representation and legal clarity. Business, meanwhile, was suffering from competitive and political disarray, and at least some viewed labor legislation as a recovery strategy — hoping that bargained wages would bolster aggregate demand and rein in their low-wage (often Southern) competitors. The result was the 1935 National Labor Relations Act (also known as the Wagner Act), which guaranteed private sector employees the right to organize, form unions, and bargain collectively. Initially, even Southern employers and legislators went along — not out of any love for organized labor, but because the exemption of agricultural and domestic workers from the act’s provisions seemed to ensure that “Labor’s Magna Carta” would be largely compatible with Jim Crow. But this wait-and-see attitude quickly dissipated. Many employers began digging in against Wagner, arguing that the act’s prohibition of “unfair labor practices” trampled upon management rights and that its “closed shop” provision (which required all workers in a bargaining unit to join the union if a majority voted for one) delivered workers “into the hands of labor dictators.” Those who had hoped for labor peace and a demand-side economic boost were disappointed on both counts. And employers increasingly chafed at New Deal measures as the World War II boom erased the last vestiges of the Depression. As importantly, the dramatic organizing success of the fledgling Congress of Industrial Organizations changed the calculus for business. Between 1935 and 1945, bolstered by new legal protections and a tight wartime labor market, union membership skyrocketed from 3.7 million (just over 10 percent of the labor force) to almost 15 million (over a third of the labor force). The sharp expansion in worker organization represented a serious threat — not only to the managerial bottom line, but to capital’s hold on political power. Local police and employers routinely responded to organizing drives with brute force and violence. Business invoked wartime patriotism to try to blunt union gains and aspirations. And southern capitalists — increasingly seeing the labor movement as a threat to the racial order that might not be contained by Wagner Act’s occupational exemptions — adopted a posture of all-out opposition. “Returning Soldiers will want security,” the Ohio Chamber of Commerce argued in 1943, “but the good old-fashioned kind of American security — the security of opportunity.” Bridling at the logic that ran from the Four Freedoms to Roosevelt’s 1944 economic bill of rights, conservatives invoked a fifth freedom — the freedom of private enterprise — as their touchstone for the postwar era. On this score, the Wagner Act — and organized labor more broadly — was the first target. The Taft-Hartley Act pushed for changes on three fronts. In an early manifestation of McCarthyism, the law required union officers under the National Labor Relations Board’s jurisdiction to submit anti-communist affidavits. It tipped the scales in labor disputes by dispensing with the expectation of management neutrality and prohibiting a range of “unfair labor practices” — including jurisdictional strikes, secondary boycotts or pickets, and wildcat strikes. And it opened the door for individual states to outlaw “union security” provisions (which required workers in unionized shops to join and pay dues to the union) through the passage of what became known as “right-to-work” (RTW) laws. The law sailed through Congress, winning the support of virtually all GOP lawmakers in both chambers, 106 of 177 Democrats in the House, and 20 of 42 Democrats in the Senate. Truman vetoed the bill, but it was a gesture seen as little more than a “grandstand play for labor support” given his willingness to quash strikes in steel and coal the previous year. And Congress had the votes to easily override Truman’s veto. On June 23, 1947, Taft-Hartley became the law of the land. In the long run, the anti-communist provision and the narrowing of union tactics had enormous implications for labor, both in places where it was weak and where it was well-established. Some unions purged their ranks of radical voices (a tack that often traded dynamic leadership for the security of federal arbitration), and those that refused to do so often ended up in jurisdictional fragments — one independent of the CIO, the other ensconced in the new national labor relations infrastructure. The law’s ban on secondary boycotts and strikes undermined local solidarity, especially in metropolitan settings where smaller, place-based locals had historically engaged in mutual strategic and political support. But the harshest blow — the invitation to pass right-to-work laws in the states — fell where labor was weakest. Within months, most Deep South states had RTW laws on the books. Ardent segregationists and civil rights leaders alike recognized that RTW was a way to maintain the color line in Jim Crow labor markets — “a whip to preserve the sharecropper wages,” as Martin Luther King put it. Over the following decade, low-wage and lightly industrialized states in the Midwest and Mountain West followed suit (see map below). By 1960, nineteen states had passed RTW laws, and another four joined the list over the next half-century. In more recent years, ALEC and its allies have pressed the issue anew — adding Indiana and Michigan (2012), Wisconsin (2015), and West Virginia (2016) to the RTW column. Taft-Hartley is aimed at you. It’s aimed at your wages, at your hours and working conditions, at your job security. Its target is your pocketbook — your standard of living. It strikes at you through your union — by crippling your right to organize and maintain a union of your own choosing — limiting your right to strike and picket and boycott — by choking your rights of free speech and free press. You used these rights to organize your own union, to fight for a better standard of living. You used them to win higher wages, shorter hours, better conditions on the job. Your union has been your chief weapon. But if the retail clerks were sure RTW would deal a major anti-union blow, identifying and measuring the law’s consequences, especially over time, is a thornier task. State adoption of RTW is staggered across the last seventy years, and many other factors — business cycles, state demographics, worker characteristics, occupational and sectoral differences across states — come into play. It is important, in this respect, to both identify the key observable differences between RTW and non-RTW settings, and to isolate as best as possible the importance of RTW status or adoption in creating or sustaining those differences. Over the long haul, the threat (or promise) of RTW laws revolved around three questions. Would they dampen or slow union growth? Would they, by undermining union power, lower wages and labor standards in RTW settings? Would they, as their proponents claimed, galvanize local economic and job growth by making RTW settings more attractive to new investors and footloose employers? Let’s take each of these in turn. Nationally, RTW — and the larger pushback against the New Deal of which it was a part — arrested the rise in union membership. In the long arc of union gains and losses across the last century (see graphic below), three junctures stand out: the Wagner Act’s passage in 1933, Taft-Hartley’s enactment in 1947, and the heavy losses stemming from trade and deindustrialization since the 1970s. Behind those national numbers, unsurprisingly, RTW states boast lower union membership across this era. In part, this is a reflection of where they started. Until ALEC and its confederates started pressing RTW in Rust Belt states in recent years, the legislation had passed almost exclusively in settings where organized labor already claimed little economic or political purchase. Across the South, RTW went hand-in-hand with both Jim Crow labor markets and bottom-feeding economic development strategies, all of which contributed to the failure of the CIO’s “Operation Dixie” organizing drive in 1946 and 1947. In the Midwest and Mountain West, RTW locked in low levels of union density and slowed the growth of labor as a political force. We only have good union membership data — by state and by sector — from the early 1980s on, but the pattern is pretty clear. In the visualizations of this data (below), the states are strung like pearls along each year — RTW states, red; others blue. The “box-and-whisker” for each year traces the variability across the states: the center point of each box is the median state; the top and bottom of the box mark off the seventy-fifth and twenty-fifth percentiles (the “interquartile range”); the top and bottom whiskers reach out to values that are no more than 1.5 times the interquartile range; outliers in the data fall beyond the whiskers. With the exception of Nevada (an outlier due to historically strong union presence in the hotel and restaurant industry), the RTW states crowd the lower rungs of the state ranking — falling well below the national median in each year. The more modest membership levels are to be expected: RTW (which allows covered workers to ride free on the backs of dues-paying members) raises the costs of winning union elections, delivering benefits, and sustaining membership. Still, this set of data is just a glimpse of the overall picture. Because it’s purely descriptive, it may capture differences — such as a local “taste” for union representation — that explain both RTW adoption and lower levels of membership. In order to isolate the impact of RTW, we need to control for other effects and variables, especially the mix of industries and workers across states. When we do so, it is clear that enacting RTW, while not eroding the existing base of membership, certainly slows its growth, yielding dramatic dips in the level of expected organizing immediately after adoption, and steady and moderate declines thereafter. Estimating the expected flow into union membership (based on sectoral growth and certification elections), David Ellwood and Glenn Fine observe a 5 to 10 percent reduction in membership due to RTW approval alone. Using microdata to isolate those private sector workers directly affected by RTW, Joe Davis and John Huston find that RTW decreases the likelihood of union membership by 8.2 to 8.9 percent. In the Midwest, Indiana (which passed a RTW law in 2012), Michigan (2013), and Wisconsin (2015) have all seen steeper membership losses than neighboring states. RTW advocates love to argue that “compulsory unionism” kills jobs and slows economic growth, and that passing RTW — either because it introduces a genuine advantage for business or simply because it signals a “business-friendly” environment — is a reliable magnet for new investment. But the timing and location of RTW makes it almost impossible to untangle the driving forces behind rates of economic growth or job creation. The economic histories and trajectories of, say, Minnesota and Mississippi since 1954 (when the latter passed its RTW law), are profoundly different, and it is folly to pin that difference — good or bad — on one detail of state labor law. In order to identify a link between RTW status and state prosperity or job growth, one would have to carefully control for a range of other factors, over a long and complicated economic history. Robust job growth in the Sun Belt after 1950, for example, is just as likely to be stoked by the spread of air-conditioning as the enactment of RTW. It would by silly, by the same token, to attribute recent job growth in Texas or North Dakota (both RTW states) to anything but the fracking boom. Indeed, the only credible measure of such an effect would have to narrow its focus to job growth in mobile firms and industries (ones that are likely and able to relocate in response to “business-friendly” policies) in which wages are an important cost of doing business. What does this literature tell us? A recent study of RTW and manufacturing observes such wide variation in employment growth that the only “reasonable interpretation” is that RTW has little effect. A report from a pro-RTW think tank examines employment trends in the ten states that adopted RTW since 1950, seeing net growth in five (Mississippi, South Carolina, Wyoming, Idaho, and Texas) and net declines in the other five (Kansas, Iowa, Louisiana, Utah, and Oklahoma). A careful study of employment effects in Oklahoma (comparing Oklahoma to the weighted average of non-RTW states that closely match Oklahoma in pre-2001 trends) finds no RTW impact on job growth. Recent work by the Economic Policy Institute identifies no clear relationship between RTW status and job growth across the states — and significant disadvantages for RTW states looking to attract higher-wage, new economy jobs. There are two mechanisms that boost workers’ bargaining power and, consequently, their capacity to raise wages and better their working conditions. The first is organization. Labor unions deliver a reliable wage and benefit premium for organized workers (especially low- and middle-wage workers), they set local wage standards that help nonunion workers, and they advocate for regulatory and labor standards that raise the floor for all workers. The second is full employment. “When labor markets are tight,” Dean Baker and Jared Bernstein explain, “the benefits of growth are more likely to flow to the majority of working people.” The evidence for this spans the last century — from the “arsenal of democracy” in the 1940s (when there was a shortage of workers and union organization was near its peak), through the heyday of postwar growth (when union power and robust employment ensured that workers shared in productivity gains) to the economic boom of the 1990s (when the US economy approached full employment and labor organization was weak). This is evident in the figure below, a boxplot of wages in RTW and non-RTW states since the late 1970s. As with the earlier graphic of union density, we see wide variation across the states, with the RTW states dropping off the bottom of the scale. The wage gap between RTW states and the rest is perhaps most pronounced for men and women at the median, sixtieth, and seventieth wage percentiles (a wage range, in 2015 dollars, that runs from about $15 per hour to $30/hour). The wage measure in the graphic above is purely descriptive, making no allowance for other differences across the states. States with RTW laws, after all, are often deeply invested in other policies — fiscal austerity, underinvestment in education, meager social policies — that depress wages. In order to isolate the effect of RTW laws, economists at the Economic Policy Institute (a 2011 study by Elise Gould and Heidi Sherholz, updated by Gould and Will Kimball in 2015) control for an array of individual (education and employment status) and state variables (cost of living, unemployment rate), and find that wages in RTW states are a little over 3 percent lower than in non-RTW states — a $1500 deficit for a typical full-time worker. That wage penalty is compounded by the fact that, in the American context, much more than wages are at stake at the bargaining table. The compensation penalty, factoring in lower-rates of job-based health and retirement coverage, is even wider. By any reasonable measure, Taft-Hartley’s provisions run roughshod over basic democratic principles and constitutional rights to free speech and free association. And they seek to defang the one institution — organized labor — that has the willingness and the capacity to protect those rights for working men and women. “Right to work,” the claims of its champions aside, is not about liberty or prosperity. It’s a pro-capital policy that saps or breaks worker organizations while offering no discernible boost to job growth or business investment. That’s the true legacy of Taft-Hartley.